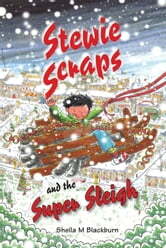 The Stewie Scraps series is ideal for reluctant boy readers, but other children will also love the stories. Stewie Scraps doesn’t do sport. He hasn’t got any time for sums or things like that, but he loves designing and making things. When Stewie’s new classmate Miles finds some old wooden skis at the back of JJ’s yard, Stewie is inspired to create the Stewie Scraps Super Sleigh. But when he sits on the driver’s seat nothing happens. Why won’t it go anywhere? Where will the Christmas magic come from?